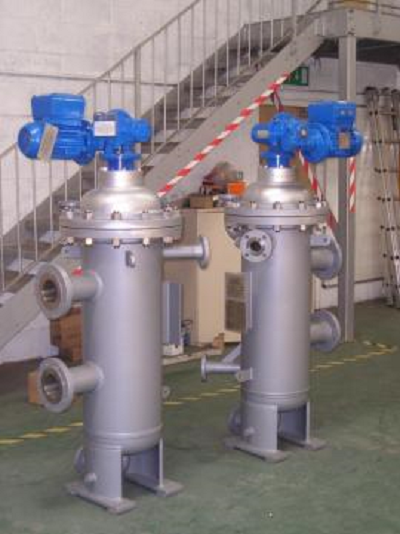 Backwashing Strainers are a type of self-cleaning strainer and are an alternative to Duplex Strainers in that they allow cleaning of the filter element without interrupting the process flow. They also have the added benefit that the element does not have to be removed for cleaning, since the cleaning operation is carried out within the unit, thus reducing maintenance and increasing economy. The internals of the unit basically consist of a wedge wire filter element assembly and a rotating backwash arm assembly. The wedge wire filter element assembly in GFSA Backwashing Strainers includes numerous robust wedge wire filter elements (slot tubes) which are capable of withstanding high pressure differentials without incurring any damage. The filter elements are open each end and are located top and bottom by precision machined mounting plates. The mounting plates are permanently fixed by a central welded tube which eliminates the need for tie rods. This allows the incoming fluid to enter the filter element from both the top and bottom. This results in an even spread of contaminant collection across its complete length which enhances backflush performance. The rotating backwash arm assembly is comprised of between one and three hollow backwash arms (depending upon the size of the unit). Each backwash arm is connected to a central manifold which locates into a sleeved bearing housing. This is permanently fixed centrally inside the lower part of the vessel and forms the backwash outlet from the vessel. Each arm also incorporates a spring-loaded reinforced PTFE piston bush which slides across each element bottom entry. A corresponding top arm assembly slides over the element top entry. The two arm assemblies are tandem linked via a central drive shaft which is connected to, and driven by, an external mounted reduction-geared motor. Various forms of automatic control can be adopted to maximise flexibility. The usual form of automated control utilises the installation of a differential pressure switch, which constantly monitors the differential pressure across the unit. Upon reaching the pre-set DP the DP switch sends a signal to the control unit to initiate the backflushing cleaning cycle. In addition, many end users also include a cleaning cycle initiated by an adjustable time switch. Normal Operation Filtration Phase: During normal operating conditions, fluid enters the unit via the inlet connection (1). The fluid enters the lower part of the housing and a partial flow of approximately 50% of the fluid is carried to the upper part of the housing via the central tube (2) of the element assembly. This means that the fluid flows through the filter elements from both ends from the inside to the outside of the element so that contaminant particles are retained inside the filter elements. See figure number 3. During the backflushing phase the main process fluid flow is not interrupted and continues to flow through the unit as previously described. The backflushing cleaning phase is initiated by a high differential pressure sensor and/or via a time switch. Once the backflushing cleaning phase has been initiated the electric geared motor (A) rotates the backflush arm assembly (C) at approximately 5 rpm, which effectively closes the top and bottom entries of each filter element in turn. 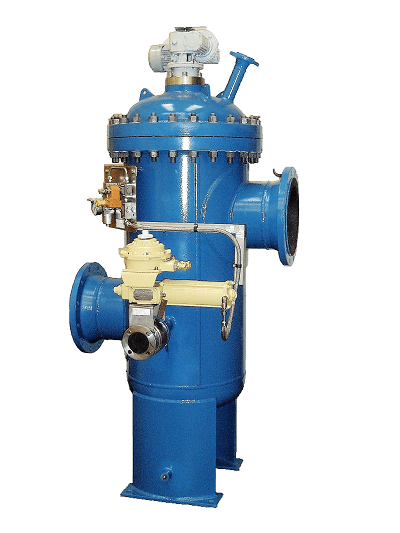 Simultaneously the backflush valve (D) is opened which creates a high axial flow within the filter element. When the ends of each element are closed from the process flow, the flow through the element is reverse for outside to in so retained contaminant particles are washed away from the retaining inside face of the element into the centre and axially down the element, through the backflush arm, manifold and exits the unit via the backflush connection. See figure number 4.